One of the things I enjoy about my position is getting the opportunity to go speak to people and pray at various events. This week I got a call from the University of Houston Victoria, which I happen to be alum, asking if I would come do the invocation for the UHV Women’s Softball Team. 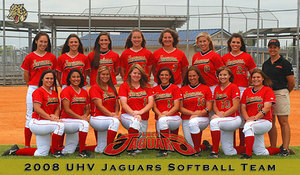 In the programs first year the UHV Lady Jaguars finished the season with a 30-16 record and ranked 15th in the nation in the NAIA. This week they received an invitation to the NAIA Tournament (kind of like March Madness for Women’s College Softball). They were having a sendoff ceremony and ask me to come do the invocation (fancy word for “pray for us”). This is a great group of girls. The entire team carries a 3.33 GPA or better. Their coach is sharp and expects a lot out of them. At the beginning of the season she had the girls get together and write out their goals for the semester and the season. So far they have accomplished most of them. Seems like my blog runs through themes. Bikes and family are always going to thread through my writing, but then it was bugs and now Women’s College Softball seem to keep popping up. I guess you never know what is going to come up next. I will let you know how they do at the tournament.